Filippo Rijli and his team at the Friedrich Miescher Institute for Biomedical Research have identified two genes that control sound discrimination in the brain. The Hox2 transcription factors act in the mouse brain stem and ensure that the auditory neurons are precisely connected from the inner ear to higher brain areas. In their absence, mice were still able to hear but no longer able to discern sounds with close, yet distinct, frequencies. While we listen to Beethoven, a second highly sophisticated orchestra of interconnected neurons between the ear and the brain ensures that we can indeed discern the different sounds and cherish the nuances of the play. This network of neurons connects the snail like structure called cochlea of the inner ear with higher brain regions. These neurons are spatially arranged in a topographic map such that sounds with close, though distinct, frequencies are processed in neighboring neuronal cascades. This organizing principle called tonotopy is preserved in all associated higher brain areas from brainstem to midbrain to cortex. Little is known about the molecular control of such a sophisticated arrangement of axons and synapses. Filippo Rijli and his team at the Friedrich Miescher Institute for Biomedical Research (FMI) have now identified two paralogue transcription factors (Hoxa2 and Hoxb2, collectively called Hox2) with an important role in setting up these precise tonotopic connections in the brainstem cochlear nuclei. In the cochlear nucleus, each axon coming from the inner ear relaying information about a specific sound frequency mainly interacts with one neuron through one giant synapse, the endbulb of Held synapse. This ensures that the sound information from the outside world is relied properly and precisely in the brain. Neurons that receive the same sound information (i.e. that respond to the same frequency) are next to each other, they form bands in the cochlear nucleus. In the absence of Hox2 transcription factors, this one-to-one connection is disturbed, the bands become fuzzy. Kajari Karmakar, former FMI PhD student and first author of the study explains: "Suddenly, neurons in the cochlear nucleus receive input from multiple smaller synapses." 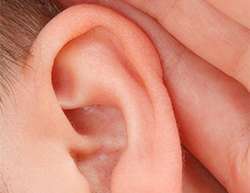 This perturbs sound precision: "We could show in collaboration with the laboratory of Andreas Luthi that mice that lack Hox2 transcription factors in the cochlear nucleus can no longer discriminate sounds with close, yet distinct, frequencies," continues Karmakar. "These results show nicely the importance of post-synaptic transcriptional regulation for the precision of connectivity in this sensory circuit and for the processing of sound information in the brain", explains Rijli, "In addition, these findings might also advance our understanding of the genetic basis of central auditory processing disorders (CAPD) in children." In these children, peripheral hearing is intact but the processing of the auditory information is impaired.